Alicia Jones holds a B.A. in Political Science from North Carolina Central University, a J.D. from Howard University School of Law, and an M.L.I.S. from the University of Illinois. In law school, she had the pleasure of working as a research assistant for the director of the law library. It was at Howard University where her fascination with library science was born and she decided she would pursue these studies, combining both of her passions, at some point in her career. In between law school and library school, Alicia worked as a project manager for a federal government contractor and a technology vendor. She also worked as a contract attorney for private law firms in New York and Chicago. In 2007, Alicia decided to continue her education and seek her master’s degree in library and information science at the University of Illinois. 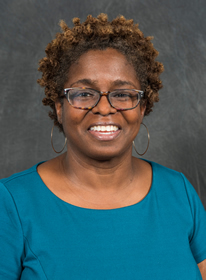 Since completing her library degree, Alicia has worked as a reference associate at the Pritzker Legal Research Center, Northwestern University School of Law, and as an assistant cataloging librarian at Moraine Valley Community College. At the beginning of 2013 Alicia joined the faculty of the SIU School of Law Library.